Aside from the recently announced HTC Desire X from the IFA 2012, we have heard less from the Taiwanese giant in the last couple of months. Not wanting to be left out of seasonal gadget’s announcement, HTC spawns some invites to their September 19 event; seven days after Apple announce the next iPhone. 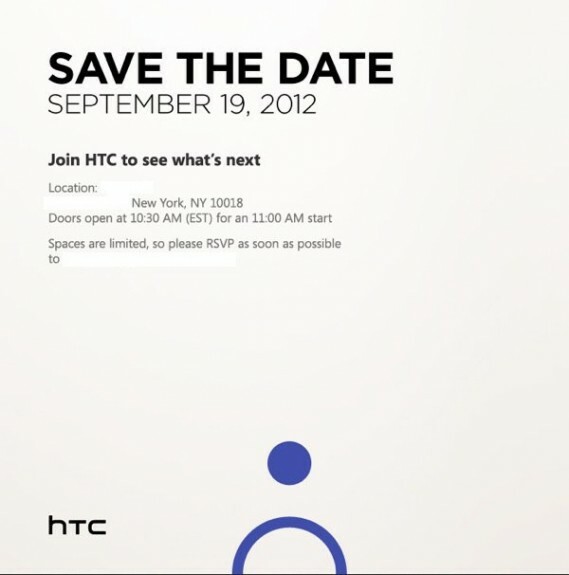 The event will be held in New York City inviting tech-afficionados to “Save the Date” and figure out “What’s Next.” Basing on the invites (Metro-ish dot and the Semicircle), HTC seems like releasing their WP8 version of HTC One that will succeed the HTC Titan II. This device is rumored to have a 5-inch display that will be a refreshed version of their current flagship, HTC One X. A 10-inch tablet may also have the spotlight in this event. We just certainly hope that this could jumpstart the sales of HTC this year after it had loses its steam between the two market giants (Samsung and Apple).